Mini review: just charged up the batteries and tried the new Q5 345Lm torch… it’s pretty flippin nice for <$25!… very intense center spotlight, but also a lot of wide spread to light up a full trail in the dark… looks like a winner! According to Torchy’s 18650 battery tests, at 1A load, *everything* drops off well before 3000mAH. 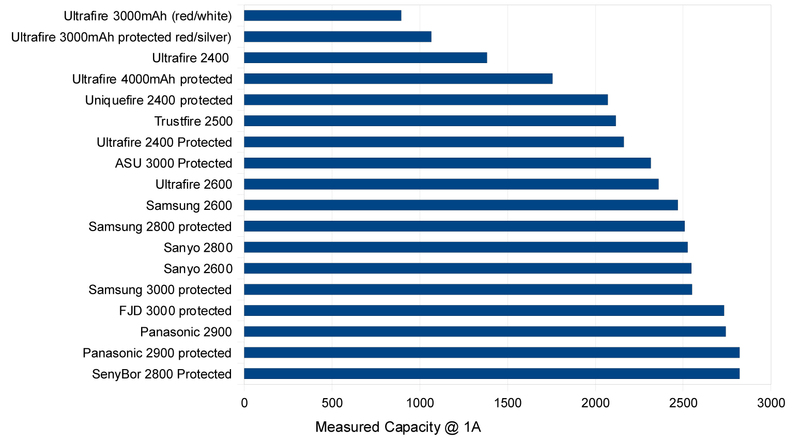 Another 18650 Shootout:… The UltraFire 3000 Protected (Red/Silver) does uncharacteristically well on his test??? Mini review: The ones like this with 360 rotating feature are harder to find, very necessary for aiming the light from my “long horn” beach cruiser style handlebars. This item feels real good in actual usage, definitely recommended… made of a very flexible rubbery plastic, soft enough that I added a washer to both ends of the tightening bolt so that the bolt heads didn’t just cut right through… the good thing is, after several trips in ~5C German weather, I can tell that this material will never shatter like so many others.